You are currently browsing the archives for the Magnolia category. Anything with wings is the challenge this week at Sentimental Sundays …. went with butterflies …. I think they look adorable on cards …. and the Magnolia image, which I coloured with Pro Markers is one of my favourites, she is so girlie girlie. 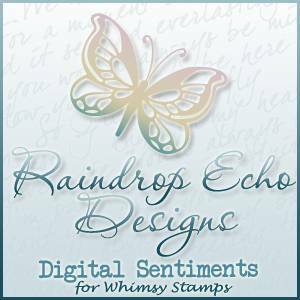 Up for grabs is four individual sentiment sets from Raindrop Echo Designs Whimsy Stamps Digital Collection and a custom watermark/signature set from Custom Designs at Whimsy Stamps …. worth winning peeps. Not that any of you talented ladies will need inspiration …. but if you do …. hop on over and look at the other DT’s work it is all fabulous. Papers I used for my card are from one of my fave designer Anna Griffin, butterfly is die cut from some very pretty blue vellum and then embossed, netting, pins, brads and flowers all from stash. Lots of folding and scoring to make these two envelope cards but well worth the effort. The cards themselves are each made from a single sheet of 12 x 12 paper …. think they were both from a QVC buy. Loads of stamping, masking, colouring, inking, glitter, micro beads, diamond glaze and punching went into these two projects but enjoyed every minute. Put the cat through the swiss dots embossing folder and covered the dots with micro beads, added stitching and lace to the Penny Black card. Just a complete and utter softee for anything that looks sweet and wow how sweet does she look. So enjoyed putting this card together, everything just seemed to fall into place. She was the other new goodie which was delivered on Friday and as they say …. leave the best till last. Coloured her with Copics, added pearls and lots of stickles bling to the umbrella, also to the buttons. The bottom layer of the pretty yellow flower is made with a very delicate lemon lace which I am slowly running out of, good job I am back home to the UK next week as I need to stock up on my lace again. Really enjoyed making this card, hope you enjoy looking. Pop on over to Crafty Angels and see the good news….Huge Drum Roll…..they have a fantastic prize up for grabs this month….not only that…. from this week on they will be picking the top 3 favourite cards, project or LO from all the entries. If you are lucky enough to be chosen there is also a blinkie up for grabs….there has been a sneak peak in the side bar for the last week….now is that good news or what. Another little treat for you is we have a guest designer for the month of April her name is Charmaine and her work is fabulous you won’t be disappointed when you check out her blog. Onto the theme for this week…. Evonne has said she would like to see… My Favourite Things….anything you like…wherever it takes you… well bit of a problem here sweetie because I love it all. Started with pastel colours…probably my favourite… then came stamping and embossing….next paper piecing it….punching… just went on and on. Can’t wait to see what everyone else comes up with…thanks Evonne for such a lovely challenge. Allsorts Challenge – Petals and Pearls…this sounds so soft and floaty. Crafty Angels time and this week we would love to see any of your Easter creations. Very late last night taking the photo and not very happy with it but best I can do at the moment. Will have to pop back later with info as I am off to the hospital this morning… fingers crossed today is the day the pins come out of my finger. Trying to type left handed and with one finger….very frustrating. Seven months later and the pins in my finger are finally out….yippee. Bandaged, stitched and strapped up but what a relief to finally be free of pain. My finger eventually realised there was a foreign body in there and an infection set in about three weeks ago…not very nice. Andrew says… just like me takes a while to cotton on….he can have that one only because he ordered my pro-markers….now you know why he bought me them, to cheer me up…(broke the mold after him). What am I like…. still managed to do my papercrafting….taking a lot longer though….. colouring, piecing, cutting paper, making bows, sticking and pasting all kept me happy….little voice in the background says…. well most of the time. Next hurdle is in 2/3 weeks, medication is being changed,wonder what new challenges that will bring. Entering this easel card for Die Cuts r us Challenge which is to make a project inspired by the colours in the DCRU image. Have to say I just love these colours and making this card was such a pleasure. Papers used are all from Pink Petticoat a lovely digi download shop which I found a long time ago and can’t get enough of them, I can always find a colour match for my projects. Also for the Just Magnolia Special Monthly Challenge paper pleating, which I love and there is a fabulous tutorial by Mina. Tilda was coloured with Copics and Pro Markers then sat her on two nesties. I stitched the paper pleating with a scalloped stitch to hold it all together. Have to say my dressmaking comes in handy at times like this but it is much easier with material than paper. Lots of matting and layering with pleating, scallops and ribbon. MS punch was used for the pleating edges and the waste pleats were added to the bottom of the card. Stamping up punches and sentiment, along with an art impressions stamp at the top of the card, flowers, brads, gems and dew drops were all added to make Tilda look oh so pretty. I opened the card out full length and took a picture to show you how pretty the colours are. My Martha Stewart around the page punches arrived this week – yummy or what – just had to try them out. I used the loop first and the next card will have the fanned shell on it. They add such a lovely element to your card. Sweetheart Tilda is going into the Just Magnolia Monochrome Challenge. She was stamped with StazOn Cherry Pink onto the pale pink paper and then cut out. Stamped her a few times to try out colouring but she looked better in the flesh so to speak. Papers were a download from Digital Scrapbook Pages. Flowers and leaves were punched from the same paper. Roses and beads were added to the middle of the flowers. I printed off a double sided piece of paper with the bright pink and the pale pink so I could fringe the edges. Tilda is sitting on a stamped image from Papermania and the edges were coloured with copic markers (tried to match the rose colour but didn’t quite manage it… another excuse to buy more). Not a nestability in sight wow didn’t think I would make a card again without one.